What’s the weather like today? This is a phrase pupils in Russian schools learn at their first English lessons. The most common answer is «It’s raining». We could also add: in St. Petersburg it’s cloudy, often windy. Or not often. Almost always. There are two popular anecdotes in Russia. «I don’t know, I’m just only six-year-old». — How long has it been raining? To put it briefly, in St. Petersburg it’s rather warm (in comparison to other parts of Russia, especially Siberia), very cloudy and rainy. The warmest months are (surprisingly) June, July and August. The best time for a visit is a period from mid-May to mid-August, and we would recommend you to come in May. Since the middle of August usually starts the season of rains. The coldest months are December, January and February. The city enjoys 62 sunny days a year on an average with totally 1628 sunny hours. In the winter days the sun is really a very rare guest. The temperature above 0 °C (32 F) is on 230 days a year as on average, above 5 °C (41 F) on 165 days. Due to its location on the shores of the Gulf of Finland St. Petersburg has a very high level of humidity, between 77% and 87%. The average level of humidity is 75%, in the summer 60-70%, in the winter – 83-88%. If this tells you something, annual precipitation is 662 mm. This results into 32 foggy days annually. The city can claim its right to be called the Russian capital of rain. After your stay here you’ll be struggling to recollect a day without rain even during the hottest summer periods. The maximum temperature recorded ever in St. Petersburg is 37,1 °C (98,7 F), the minimum is – 35,9 °C (– 32,63 F). It’s often colder in nearby areas outside of the city than in the city itself, the difference between Saint Petersburg and, for example, a town of Pushkin can be 10-12 degrees Celsius. The city center is hotter than sleeping districts, the difference can be 2-3 degrees. A stereotypic image of Russia is an area heavily covered by snow. St. Petersburg, yes, is buried under snow sometimes, and sometimes it’s even difficult to pave your way through to your destination. But a normal winter doesn’t bring too much snow to the city, and in the downtown with its heavy traffic and crowds of people it may lie 1-2 months. Outside St. Petersburg, for example, on your trip to Vyborg or Ivangorod you can see vast areas under snow. The weather in St. Petersburg is very unsettled. No, when we say “unsettled” it really means this word. Unpredictable, that’s even more accurate. The most precipitation is between April and October with peak in August and minimum in March. The average number of rainy and snowy days is 200 a year. The cloudiest days are in the winter, fair days dominate in the summer. 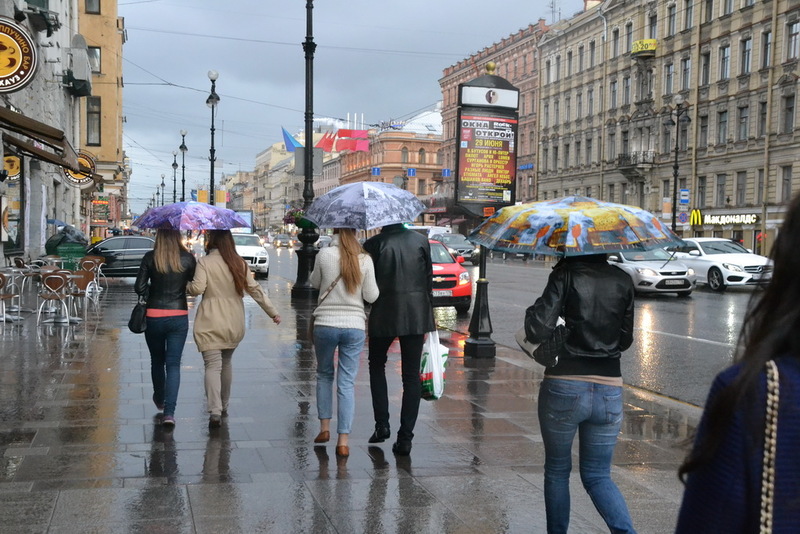 Whenever you’re traveling to St. Petersburg, consider taking with you at least a coat or a jacket in case of rain. This advice is valid even for summer periods when weather forecasts promise sunny days throughout the whole week. When walking out, do not forget to take your umbrella with you. It’s hard to believe that the bright sun you’re enjoying with at 10 a.m. can be replaced by a severe shower in just two hours, but this sometimes happens. We warned you (see above): unsettled means unsettled here, not anything else. And do not believe the meteorologists, especially, their midterm and long term forecasts. 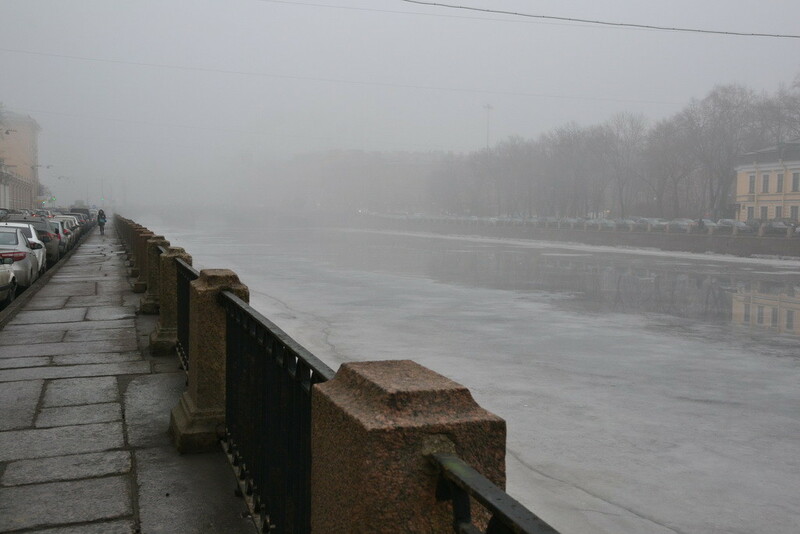 The most dangerous thing about the weather in Saint Petersburg is not rain, snow, frost or even flood. Really, not a big deal, albeit sometimes troublesome. Latent threat (which makes it worse and more dangerous) is a situation when the temperature is oscillating between plus and minus. In the warmer time (day) ice and snow is melting and the colder time (night) converts them into slippery surface of sidewalks and pieces of ice hanging down from roofs over residents’ heads. Almost every year a few persons die from head injuries with dozens or hundreds being admitted to hospitals because of contusions and fractures. If you have ever been to Siberia or any other kingdom of cold on the Earth you may think that St. Petersburg’s minus 5 °C or even minus 10 °C is a sort of thing not to pay much attention to. We would like to warn you before you get out in autumn-style shoes without a hat: due to humidity cold is being felt much more painful than in dry frost areas of tundra. Believe us, one member of our editorial team is from the heart of Siberia. Your shoes. Our condolences. Lot of water and mud on sidewalks will hurt them much. Due to nature of soil Saint Petersburg is a rather dirty city in comparison to Helsinki, for example, or any German town. The best period to visit St. Petersburg? You think summer? We think not. It’s May, though someone could argue (and we appreciate your comments). Just look, a day average temperature above 0 comes in early April, toward the end of the month it’s already + 5 and +10 °C in May, not a big difference from June’s +15 °C. At the same time no long queues to the Hermitage museums, the fountains of Peterhof are already open, boat trips are available and many hotels and apartment-for-rent-companies are waiting for June, 1 to raise their prices. By the way, about accommodation In St. Petersburg read this article.